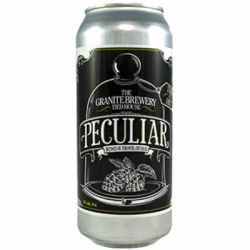 Peculiar is a dark ale with a slightly sweet but dry palate. UPDATED: MAY 19, 2018 Tap, Water & Bone, Halifax. Pours mahogany, low carbonation, zero haze. Taste is caramel, sweet malt, almost no hop. Well made if a tad light. Soft aroma of soya sauce, no head and a dark copper body. Flavour is soft hoppiness tempered by just a touch of malt character. Not too interesting but drinkable. On cask tap at The Henry House in Halifax. Copper body with good clarity topped by a durable, light tan head. Sweet and roasted grains with faint hops in the aroma. The flavor follows. A touch more bitter than sweet. Smooth, near medium body. Alcohol more obvious than it should be in both the taste and the feel; especially in the taste. Some toffee up front and again in the aftertaste. Right out of the bottle (650ml) lots of wet banana bread batter scents. Dark red tea water with a thick grayish off-white head that looks like frothy latte. Some spicy notes and a bit of cloves with a heavy yeasty base in the aroma. Wet or sweet taste and very fruity even dark raisin flavours. Upfront bold high gravity profile balance and refreshing. Tap at the brewpub. Dark, clear, coppery-mahogany brown with a nicely retaining off-whtite head. Roasty-toasty nose and flavour, sour red berries and nuts, prunes, somewhat citric. Feels more bitter and strong than it actually is. Crisp. Lemon drop kind of finish. It’s quite nice. UPDATED: JUL 21, 2015 Sampled on draft at the brewpub this beer poured a dark caramel color with a small soapy white head that left good lacing. The aroma was tart, bitter, fruity and had touches of honey and toffee. The flavor was tart, bitter, sour caramel, vague fruits and citrus. Medium length finish. Medium body but a bit flat. Meh. Pours dark brown with a small diminishing white head. Sweet aroma of light hops and caramel malt. Flavour starts off sweet and ends lightly bitter.